Little Kaspey may be too small for Big Johnny to let him ride, but in a few years this Daddle is going to be mighty useful in the Biggs house. 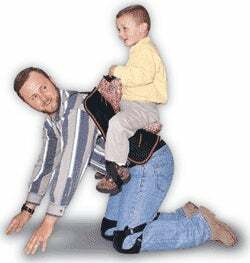 The Daddle—is it dad + saddle or dork + saddle—lets fathers strap it on their back to give kids two to six a daddy-back ride. There's a "soft saddle horn and adjustable stirrups" to complete the horsey feel. The saddle is available for $50 and kneepads for $32, since you're not a young man anymore.